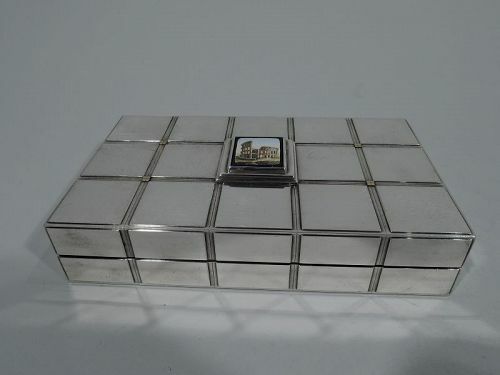 Stylish Italian sterling silver box. Rectangular with flat and hinged cover. Tessera-style square blocks on cover and sides. Micro-mosaic depicting Roman Colosseum applied to cover center. Box and cover interior wood-lined. A smart and modern Grand Tour souvenir. Fully marked with Bulgari stamp and second stamp (post-1967) for Florentine maker Guerrazzi Fiorenzo. Numbered 5184. Overall condition very good. Micro mosaic perfect. 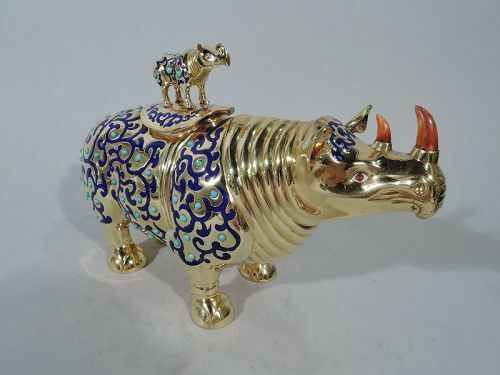 Chinese silver gilt and enamel box. Rhinoceros-form with flexed ears, concentric neck rings, short stumpy legs, and outsized hoofs. Rich yellow gilding embellished with cobalt enamel scrollwork and cabochon-cut turquoise beads. Oval dorsal cover with baby rhinoceros finial – same in small scale. Marked Silver. Condition: Very good with excellent gilding. Minor enamel loss on head. 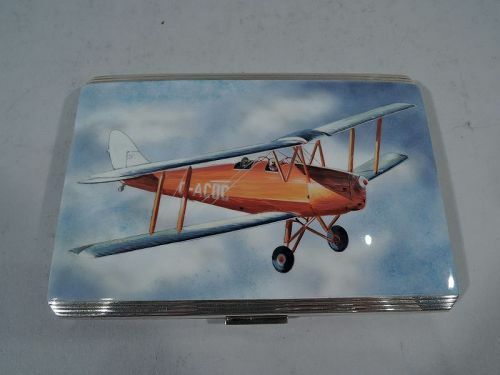 Elizabeth II sterling silver and enamel cigarette case. Made by Willian Neale & Sons, Ltd in Birmingham in 1956. Rectangular and hinged with chamfered corners. On cover in enamel is an early 2-seater airplane piloted through blue sky and fluffy white clouds. A serene depiction of flight only a few years after World War II. The scene is between reeded silver borders. Case back engine-turned. Interior gilt. Hallmarked. Fine color. 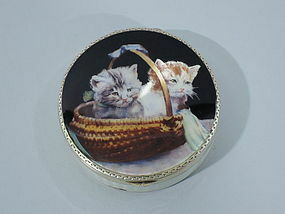 Antique silver gilt and enamel compact with cats in a basket. Round with flat and hinged cover. On cover two kittens cuddle in beribboned basket. They have pink noses, whiskers, and lots of soft fur. They're real fluff balls. Color heightened by unusual black ground bordered by incised silver gilt ornament. Box sides white enamel between silver gilt borders. Cover interior has mirror. Unmarked – possibly Austrian. Excellent condition.